The great thing about the Step-IN program is that we do not only learn specific theory about gastronomy and hotel business, but relevant practical skills too. We often had little competitions to see who could gain the skills the fastest. Like who could balance a tray full of cups with water backwards whilst going through an obstacle course. Or who could fold the most beautiful napkin flowers and set the table for a six-course-menu the fastest. Besides that, we cooked many delicious meals. 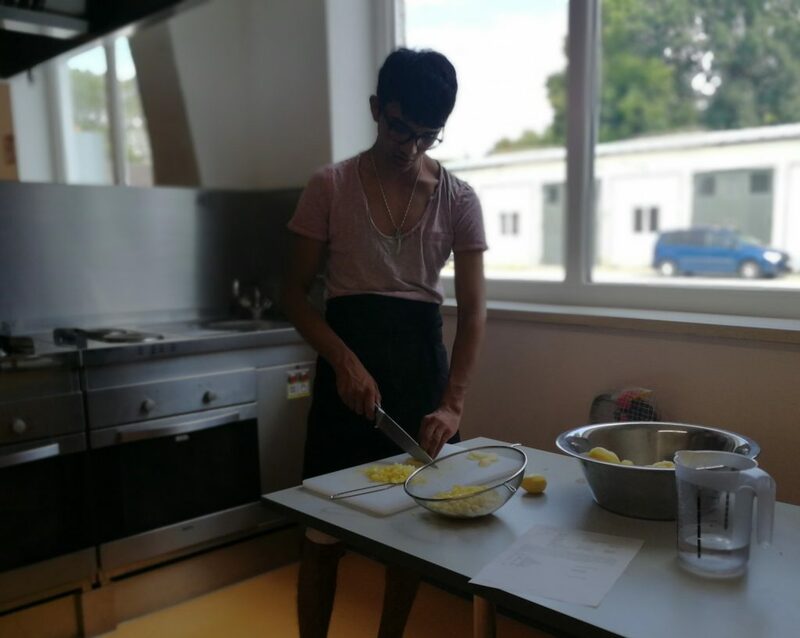 Sometimes other participants introduced traditional meals from their home countries, but we learned how to prepare regional German dishes too. For example, the five different potato dishes I was talking about: baked potato, fried potato, potato salad, mashed potato and Bolani, an Afghan dish. Me practising my new favourite hobby: cutting potatoes. In Afghanistan we eat a lot of rice, and to be honest, we think that Germans are slightly potato-crazy. The impression I get is that many Germans might even go for potato ice cream. That day we washed, peeled and prepared so many potatoes – I felt like a little potato myself. They seemed to be everywhere – and I was all mixed up. Nevertheless, we had loads of fun and I was laughing a lot with my new friends. But not everything was always so simple. My time at Turing Tables definitely entailed several challenges as well. The interview at apprenticeship company was the first one I have ever had in my entire life. I had worked as a construction worker and bakery assistant before, but work matters are treated differently in my home country. At this interview, there was much at risk for me, as an apprenticeship can protect the trainee from getting deported – at least in theory. One can get permission to stay for the duration of the apprenticeship, as well as for two more years if the apprenticeship has been completed successfully. This means, that getting an apprenticeship can be the crucial factor on whether a refugee is allowed to stay in Germany or is forced back to their home country. Me and my friend Zainab, preparing for interviews. Therefore, an interview for an apprenticeship isn’t just about the training position – it is an important step towards my future, and the outcomes would have a huge impact, coming down to my very existence if I was to be sent back to Afghanistan. Accordingly, the pressure I felt on me right before this conversation was extremely high. I had no idea what would come next. I felt the anxiety starting to grow in me. So I only focused on how much I really wanted this apprenticeship. And just like that my fear was gone. The result? For 22 days I am welcoming guests from all over the world to Hilton Munich Airport – with a big smile on my face. Now I know that I can accomplish a lot of things, I just have to dare to try and take the first step. This apprenticeship is the first time in my life, that I am following my own, ambitious goals and actively doing something to shape my own career. I hope that it will open new doors to new opportunities, so I can build up my own, independent life in Germany. I would have never thought that I, an unexperienced refugee, would end up in such a renowned hotel. I am really grateful for this opportunity. So I will work hard and do anything, to complete this apprenticeship successfully and graduate with good grades. Who knows, maybe one day I will be able to fulfil my two other, crazy dreams such as visiting every country in the world once and to going on a road trip through California – in my own Rolls Royce. Thanks to Turning Tables, I can look into the future with a big smile on my face.